It can be a difficult task, finding the right place to buy Bitcoin and Ethereum in the UK. 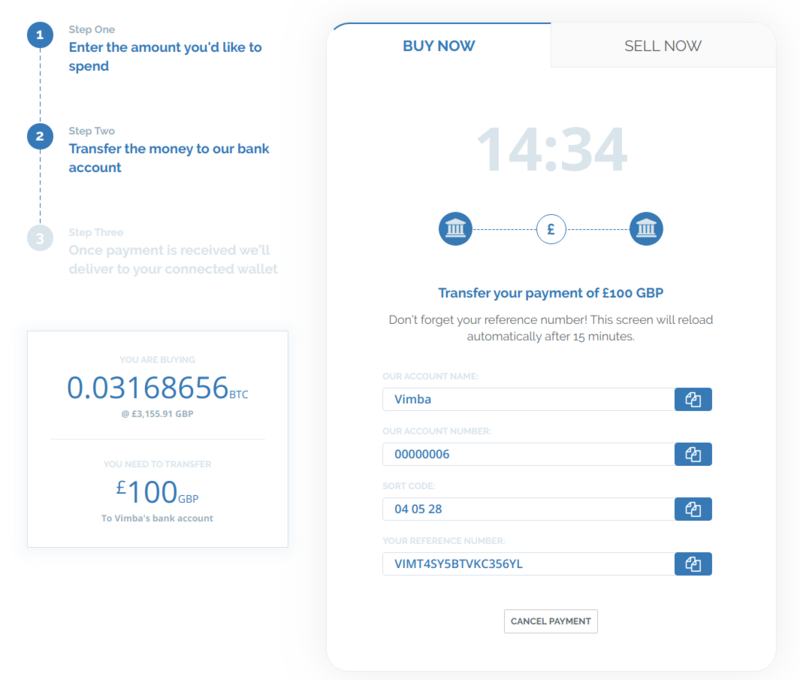 You want to find a service you trust, that can accept GBP and will give you full control of the crypto you buy. So which service matches all three criteria? There is only one name that comes to mind and that is Vimba. Our unambiguous fee schedule, non-custodial business structure and perfect security record are just three reasons to trade with us. We also offer innovative features for long-term cryptocurrency investors, top-notch customer support and more. Few other cryptocurrency purchasing services offer a savings service, which gives you the option to set up automatic cryptocurrency purchases. This method of investing is called Dollar Cost Averaging, or DCA. DCA is a low-risk technique for acquiring new assets. It minimizes risk and lets you take advantage of periodic price dips. Many traditional investment plans like 401(k) retirement plans, for example, rely on DCA. Watch out for cryptocurrency purchasing services that advertise that they don’t charge commission fees. The cryptocurrency services that don’t charge commission make money by offering their users an unfair exchange rate each time they trade fiat for crypto and vice versa. This hidden fee is often referred to as a spread fee. Our fees are both transparent and fair. When you buy cryptocurrency through us, we charge a small fee to cover the costs of the transaction on the network, FX and exchange trading fees, this is 1% or less. We then charge a 3.5% fee on top of that, which helps us keep the lights on. Our attention to detail when it comes to threat detection and deterrence has prevented us from experiencing the security issues that have plagued many other cryptocurrency exchanges. In fact, the financial stability that we enjoy as a result of our successful security efforts is one of many reasons why the government of New Zealand recently awarded us a research and development grant. Another factor that has helped us avoid security issues is the fact that we’re a non-custodial exchange. What that means is that each time you buy cryptocurrency through Vimba, your funds get deposited straight into the cryptocurrency wallet that you control. That puts you in charge of your funds. The majority of cryptocurrency exchanges like Coinbase, for example, are custodial exchanges. To put it another way: they store their customers’ funds on their own servers. Custodial exchanges are targets for hackers. Because we don’t store our customers’ funds, we’re less of a target. One of the biggest advantages that Vimba has over competing for services is speed. Vimba is one of only two cryptocurrency exchanges that integrates with the UK’s Faster Payment Service (FPS). Through the FPS, Vimba users can transfer money to and from their bank accounts instantaneously. Since most other cryptocurrency exchanges are not as well-connected to the fiat banking world, transfer delays and other hassles are common. How does Vimba compare to other cryptocurrency services? Here’s a quick rundown of how Vimba stacks up against other Bitcoin and Ethereum buying services that are available in the UK. Coinbase is the only other cryptocurrency exchange that supports Faster Payment Service bank transfers so it’s the only one that’s just as fast as Vimba. However, the downside of Coinbase is that it’s a custodial exchange not a non-custodial exchange like Vimba. That means that you don’t have full control over your crypto funds when you use Coinbase. At any time, Coinbase could decide to lock your wallet to demand more ID verification or for any other number of reasons. Coinmama is a non-custodial exchange, just like Vimba. However, Vimba is not only faster but is the clear winner when it comes to security. Hackers raided Coinmama in February of 2019 and stole roughly 450,000 emails and passwords. According to CoinTelegraph, shortly after the attack, it was discovered that hackers were buying and selling Coinmama user data on the dark web. Like Vimba, Bitcoin ATMs are user-friendly and convenient. However, they are also much more expensive to use. According to data collected by CoinATMRadar, most Bitcoin ATMs charge around 8% in fees. That’s double the fees that we charge. CEX.IO caters to the needs of day traders and institutional investors with leveraged trading, API access and other advanced features. Its interface is equipped with many types of detailed charts and its drop-down menus let you customize your orders. However, all this may be too confusing to people who have never used a brokerage service before or that are simply looking for a quick and easy way to buy and sell Bitcoin and/or Ethereum. Changelly is like Vimba in that it’s a non-custodial exchange. However, Vimba has a number of features that Changelly lacks. For example, there’s no way to link your bank account to Changelly. The only way to buy crypto with fiat through Changelly is with a credit card and the fees for that are quite high. Each time you place an order, you’ll get hit with two different fees. In the end, you’ll pay 10% each time you make a credit card purchase. LocalBitcoins is unique compared to the other cryptocurrency purchasing services mentioned above because it’s a decentralized Bitcoin marketplace a sort of eBay for trading Bitcoin. Its main perk is that it’s available everywhere. The major downside: LocalBitcoins vendors are forced to sell Bitcoin for much more than it actually costs in order to cover the cost of doing business. Moreover, even though a rating system helps guard against fraud, scammers can still be found on the platform. In addition, there is no way to buy Ethereum through LocalBitcoins. BTC is the only crypto you can trade. 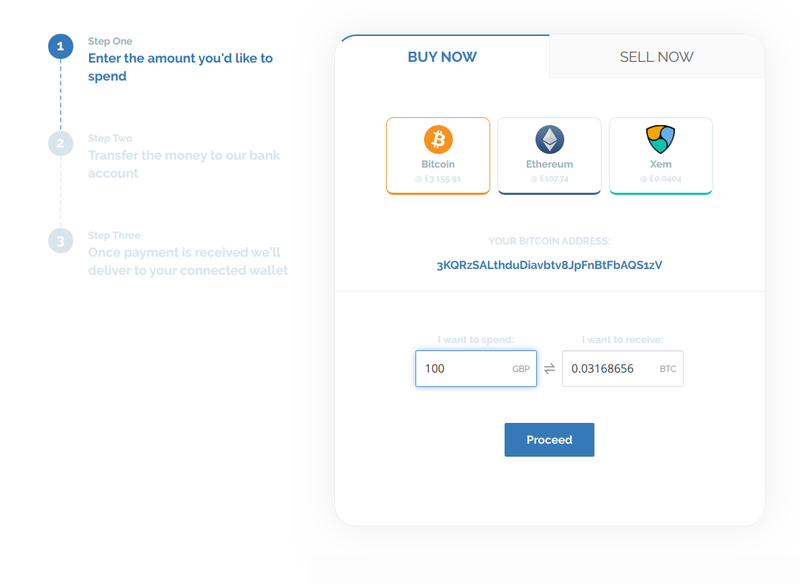 Below are screenshots showing you how to instantly buy Bitcoin and Ethereum in the UK with Vimba. Go to vimba.co, then click the Sign-Up button on the top right side of the page. That’ll take you to the form depicted below. Provide your name, email address and a password. Next, you’ll have to verify your email address. The setup wizard will then ask you to enter and verify your phone number, you’ll need to provide a BTC address for Vimba to deliver to and there’s a simple KYC process which requires you to have a passport or drivers licence and then you’ll be ready to buy. When you’re ready to buy, click the Buy/Sell button from your account’s main page. You will see the Buy Now / Sell Now tabs depicted below. Click the Bitcoin icon if you want to buy Bitcoin and the Ethereum logo if you’d rather buy Ethereum. Then, type the amount you want to buy into the form. Now all that’s left to do is to select the bank that you intend to use to finalize your payment. Simply pick your bank from the drop-down list and click continue. Next, you’ll receive an email that tells you that we’ve received your order. If you want to check its status, click Transactions on the top of the page. You’ll be able to see that your order’s status is “Buying.” Within 20 minutes, the status will change to “Delivered” and your funds will have been deposited into your Bitcoin or Ethereum wallet. If you need help getting started, feel free to visit our knowledge base or use the chat icon at the bottom right side of the screen to live chat with our help desk.